chataboutmoney is a consumer webchat service providing guidance on all matters pertaining to finance. Built for PR firm Lansons Communications, chataboutmoney runs live online question-and-answer sessions allowing users to interact directly with guest experts on matters such as mortgages, pensions, inheritance tax, financial compensation claims & pet insurance, to name a few. 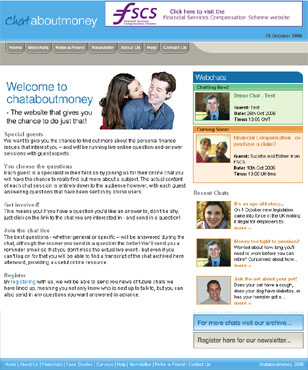 Since it's launch at the tail end of 2005, chataboutmoney has broadcast webchats for numerous clients - including Scottish Widows, Financial Services Compensation Scheme and Tax Watchdog - syndicated and white-labelled across more than fifteen major portals, ISPs and consumer websites examples of which can be seen on AOL, Orange, Virgin Media, The Mirror, The Times, Supanet and Handbag. The objective was to deliver reliable, rich content to a high-bandwidth audience for the duration of each hour long webchat. This involved an entirely bespoke solution drawing together an office-based broadcast studio with administrative Q&A panel using Windows Server 2003 hosting environment serving ASP web pages driven by a MS SQL database.